Established through federal legislation, Metropolitan Planning Organization's exist throughout the United States in urbanized areas of more than 50,000 people. Comprised of representatives from local, state, and federal government agencies, they are responsible for planning and prioritizing projects for federal funds. The transportation planning process began with congressional approval of the Federal-Aid Highway Act on October 23, 1962. The legislation required that urbanized ares (defined as areas with a population of 50,000 or more), programs for Federal-Aid Highway projects approved after July 1, 1965 must be based on a "...continuing and comprehensive transportation planning process carried on cooperatively by states and local communities." This required "Three-C" planning process established the basis for metropolitan transportation planning used today. 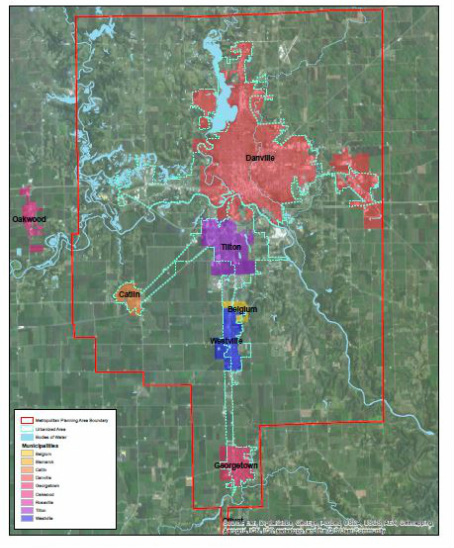 The Danville Area MPO is the federally-designated transportation planning agency for over 172 square miles and more than 50,000 people throughout Vermilion County. Serving as a regional partnership among the United States Department of Transportation, Illinois Department of Transportation, transit agencies, local elected leadership, local planning and urban services employees, the business community, and citizens across the county, the MPO leads in the development of the region's long-range transportation plan and short-range Transportation Improvement Program, and contributes to ongoing conversations about issues such as land use, economic development, the environment, safety and security, and public health. The MPO has the authority to plan, prioritize, and select transportation projects for federal funding appropriated by the United States Congress through the United States Department of Transportation, Federal Highway Administration, and Federal Transit Administration; and is responsible for ensuring the region is in compliance with federal planning requirements. The Danville Area MPO is comprised of a Policy Board, a Technical Committee, and Advisory Committee, and Staff. The DATS committees include representatives from: the City of Danville, the City of Georgetown, the Village of Tilton, the Village of Belgium, the Village of Westville, the Village of Catlin, Catlin Township, Danville Township, Newell Township, Georgetown Township, Vermilion County, Danville Mass Transit, CRIS, Vermilion Regional Airport, and the Illinois Department of Transportation. The Policy Board consists of elected officials representing Vermilion County, Illinois DOT District 5, the City of Danville, and the Village of Westville. The Board provides policy direction and a forum for transportation decisions. This committee assumes the decision-making authority for the Danville Area Transportation Study (DATS) and establishes policies that guide and form the transportation planning process. The committee has a variety of responsibilities, which range from approving the annual Transportation Improvement Program to establishing the boundary of the study area. The Board meets as needed to approve major planning reports and documents. The Technical Committee consists of administrators, planning directors, and transportation engineers from local governments and transportation related agencies. The basic responsibilities of the Technical Committee include collaborating with staff to provide recommendations to the Executive Board in the development of regional transportation plans and programs. The MPO Staff provides professional transportation planning services and ongoing administration of planning projects to the entire region. results in plans and programs consistent with the planned development of the metropolitan area. The Federal Highway Administration (FHWA), Metropolitan Planning and Federal Transit Administration (FTA) Section 5303 urbanized area formula planning funds, are made available yearly to the designated Metropolitan Planning Organization (MPO) which is responsible, together with the State, for carrying out the planning activities. Below is the 2010 review of the MPO which shows the progress that DATS has made since its inception, strengths the MPO has as well as areas that the FHWA and FTA found room for improvement. The MPO is funded by federal grant programs authorized by the U.S. Congress and by contributions from the Illinois DOT and local government members. For more information about funding for planning activities, visit the Unified Planning Work Program. For more information about funding for roads, bridges, transit, and pedestrian facilities, visit the Transportation Improvement Program.